As you can tell the paper cuff design got me started. As I kept going I ended up with three GeoBursts. 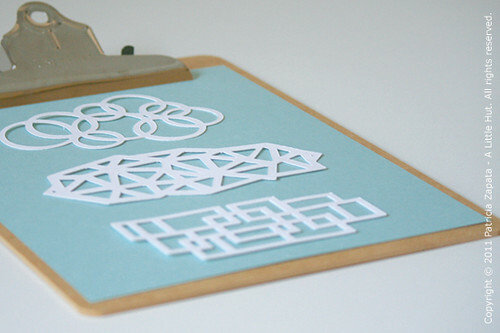 They can be easily replicated with a circle ruler or by simply hand drawing triangles or rectangles that overlap each other. Handmade versions would have great character. I've been asked many times about my process and frequently it works just like this. One idea leads into another. I started with a cuff and I'm going to end up who knows where. I'll post anything new that I may try with the cuff. Thank you for sharing your ideas! I started using these patterns in different ways and I'm already thinking of new ideas. I've made a few cards for my stash, a couple of bookmarks (I'm making some headway with some reading—no titles worth mentioning—basically fun fluff) and a notebook. I bound the notebook with a new toy I'll show you this week. I'm trying to come up with more excuses to use it. Love it. 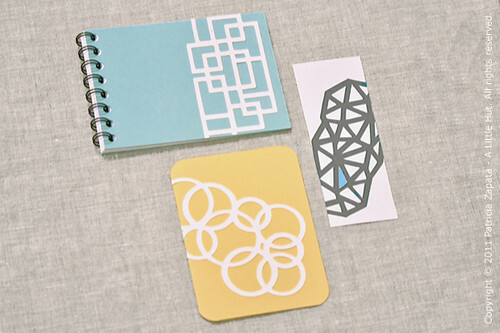 If you'd like to work with these designs as cutting files they are now in the shop. 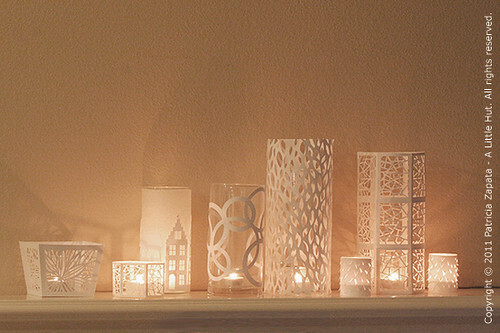 Check out how my tea light covers collection is growing! See the one in the middle? It's the same pattern I used on the yellow card above. Can't you see these used in a table setting at a wedding or an evening event?